Detail of Muswellbrook Citizens’ Memorial. 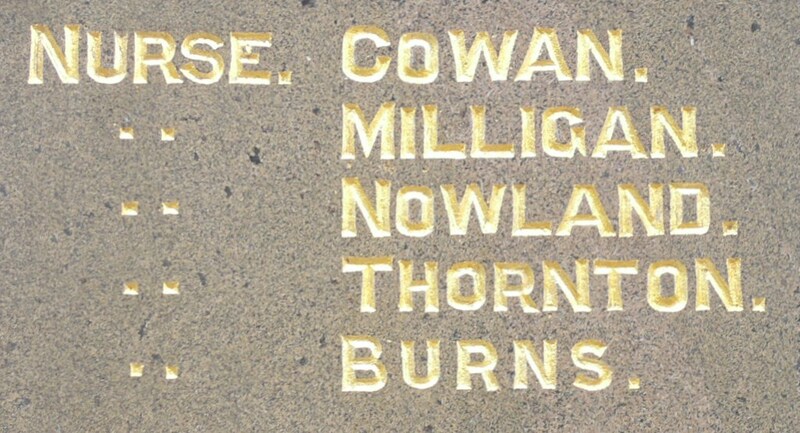 Connection to the Hunter – Nurse Thornton is named on Muswellbrook Citizens’ Memorial. A ‘Pearl M’ Thornton was born to Sydney and Annie Thornton at Muswellbrook in 1889. The age and place of birth fit, but further research is required to confirm that Pearl M Thornton and Nurse Thornton are the same person. There is no record of a Nurse Thornton on the AIF Nominal Roll, Embarkation Roll or in service records. Do you know more?